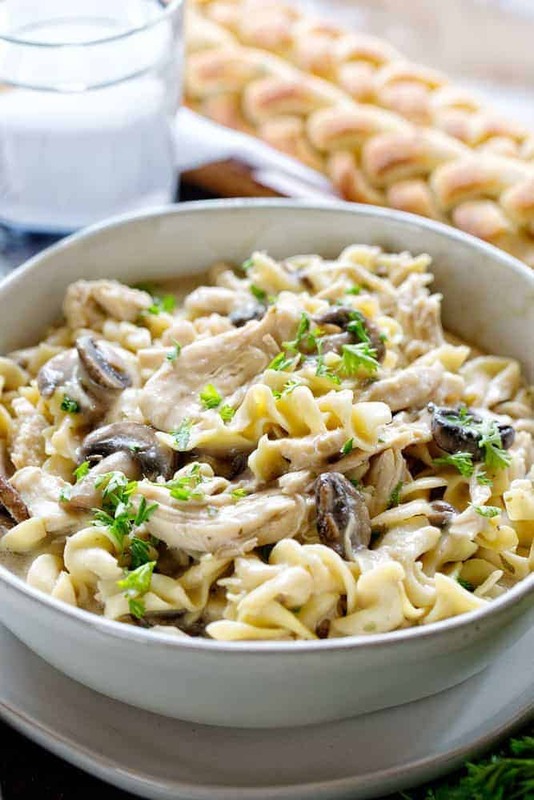 This creamy slow cooker chicken and noodles recipe is filled with hearty chunks of chicken and fresh mushrooms. It is silky smooth and scrumptious and quite possibly the easiest chicken and noodles recipe out there! Crockpot Chicken and Noodles is a completely addicting recipe and so comforting at the end of the day. All of the big chunks of meat and mushrooms pack every bite with loads of flavor. The chicken should be one inch or larger. You are going to shred it with a fork so, don’t worry about being too precise. The mushrooms we use are big too, but we love big earthy mushrooms. No worries if you are not a mushroom fan. If you don’t like them, just skip over that part! 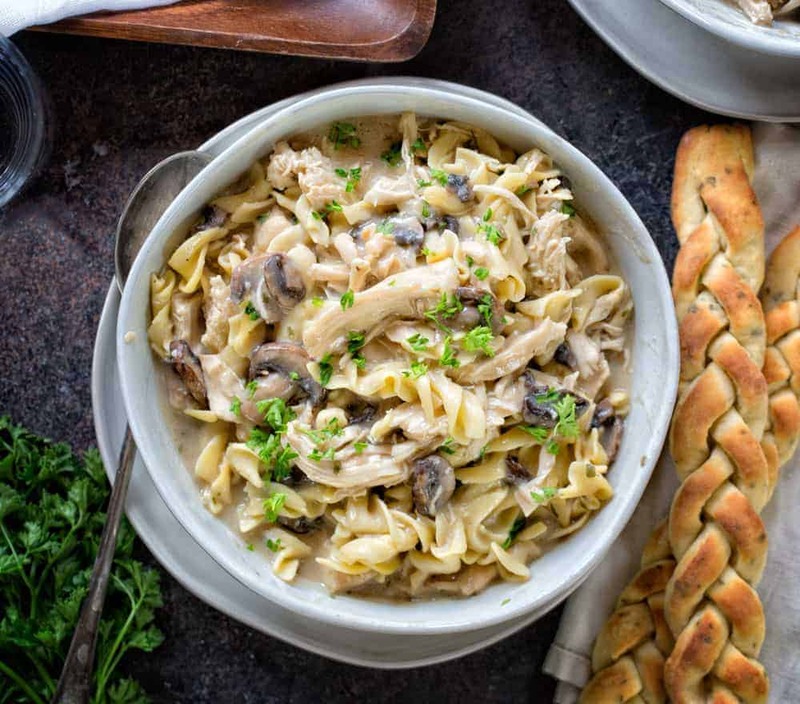 It takes only 10 minutes to throw this delicious creamy crockpot chicken and noodles recipe together before you head out the door and another half hour when you get home; just enough time to wash up, set the table, and call everyone to eat! Make a double batch of this easy crockpot chicken and noodles recipe and the leftovers are just as amazing! This is comfort food in all of its glory. Sometimes we like to swap out the chicken for turkey or even rotisserie chicken (just make sure you adjust the cooking time if you are adding pre-cooked meats). We like to add in different veggies too, such as cooked carrots or peas. Kindy of like a saucy, pasta version of chicken noodles soup. Seriously…give me this meal, a fireplace, and a good book. I’ll talk to you guys later. If you are feeling like making things from scratch, there are a few ways to make this meal even more homemade. 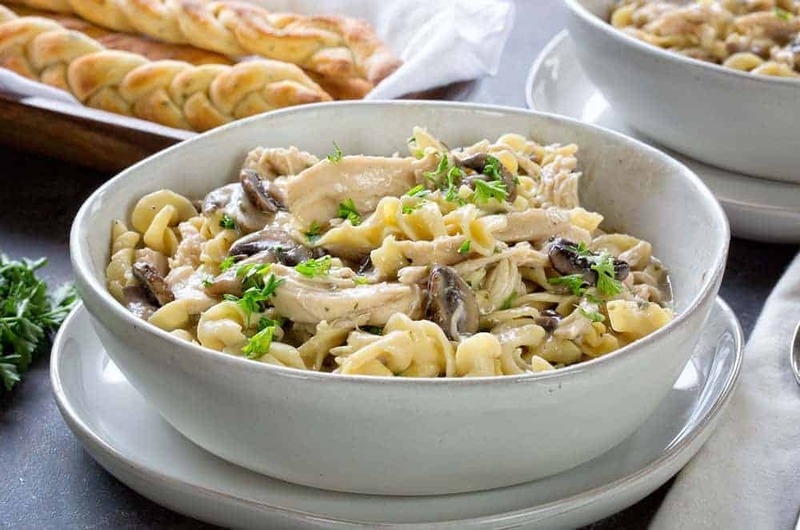 Try this recipe for homemade Cream of Mushroom Soup or this one for made from scratch egg noodles. These are so much better than the store-bought version! It may seem like a silly question, but it is one that I get quite often. Mushrooms grow low to the ground, so they get pretty dirty. Even the mushrooms you purchase at the store need to be cleaned. The trick to cleaning mushrooms is to use a damp paper towel and rub lightly, one at a time. Do not soak them or rinse them. Mushrooms will absorb liquid and they will lose texture and flavor if you submerge them in water. Once they are cleaned, sit the mushroom upright on the stalk. With a very sharp knife, make thin slices from end to end. What do I serve with Crock Pot Chicken and Noodles? If you are looking for a side to balance this meal out, try our no yeast Breadsticks. (We braided them in the picture above!) Also, you could mix it up with a side like Browned Butter Brussel Sprouts. Can I Make Chicken and Noodles Without a Crockpot? Absolutely. The great news is that this recipe is just a quick, easy and Delicious without a crock pot. 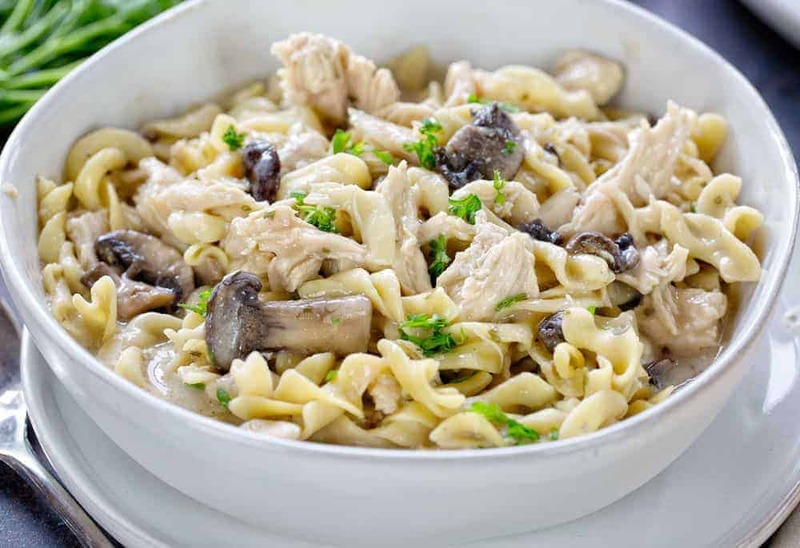 To cook this chicken and noodles recipe without a crockpot just follow these simple steps. Heat a pan or skillet over medium heat and cook the chicken until it reaches an internal temperature of 165° Fahrenheit. Cut the chicken into 1/4 inch cubes and set aside. In a small saucepan, heat the soup and seasonings and mushrooms over medium-high heat until combined and bubbling, stirring occasionally. Add the cooked chicken and serve! 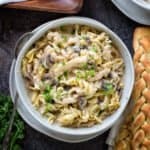 Can I use this Chicken Noodles recipe to make a casserole? Yes, but I would add a few things. Cooking this chicken and noodles casserole style in an oven might dry it out. I would suggest adding some sour cream and maybe some freshly shredded cheddar cheese to even out the flavors and make sure it doesn’t get too crispy. To make this recipe as a casserole, start by heating your oven to 350° Fahrenheit. Cook and drain your egg noodles. In a large bowl, mix together cooked chicken, soup, seasonings, 1 1/2 cups sour cream, and 1 cup shredded Cheddar cheese (4 oz). Add the cooked noodles and stir to combine. Season to taste. Spread your mixture in a greased 9×13 baking dish. If you want a crispy top, you can sprinkle on 1 cup of breadcrumbs. Bake 25-30 minutes or until bubbly and cooked through. Looking for more Crockpot Recipes? Looking for more Chicken Recipes? Season chicken with parsley, salt, bouillon, and garlic powder. Distribute the butter over the top. Pour in the chicken broth. Cook on low for 6 hours. Remove the chicken and shred using two forks. Return the shredded chicken to the slow cooker and add the uncooked egg noodles. Stir to cover the egg noodles with liquid. Cook on low for 30 minutes to 1 hour, just until the noodles are cooked and have reached your preferred taste. 6 Quart Crockpot: Everyone needs a trusty crock-pot. I have several sizes for different types of recipes. This crockpot is large enough to fit a family size meal inside. I like this one because it latches on the sides, locking in the heat. Did you Make Slow Cooker Chicken Noodles? I want to hear about it! Take a picture and tag me on Instagram or on Facebook. I would love to see your finished product! Make sure to tag me @iamhomesteader or hashtag #iamhomesteader, or both! Any substitutes for the mushrooms (not broccoli, he hates that, too)? I’ll be using cream of chicken soup, but I’m at a loss. Don’t say peas, they’re too “green.” Oy. This looks really good. I am going to try it soon. Do you have the recipe for the bread in the picture please? I made this for dinner last night. I made one change. I added cream of chicken soup. It was very good. Really enjoyed it. My husband said before I made it. He didn’t like chicken noodle soup. He said it was delicious he liked it. Very good during this cold weather.